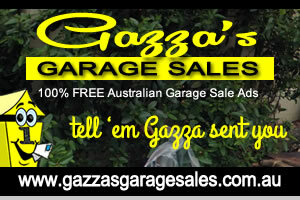 When you get to a garage sale, tell ’em Gazza sent you, thats what his web site says. Gazza’s Garage Sales is the home of garage sales online in Australia. Gazza’s Garage Sales provides sellers with free advertising of garage sales all year round. Gazza’s Garage Sales provides buyers with a directory of upcoming garage sales where they can build a list of sales they wish to visit, print and get shopping. We you got a garage sale..